Balancing precariously on the edge. I feel like I’ve broken the ice now, so I hope to be posting a lot more now. Up until now I’ve thought ‘I can’t post about that, no-one will be interested’. It’s either that or shurrup and hide on Facebook. Worth a punt I suppose! Here’s what I was working on last night. I’ve been trying to master how to make chainmaille bra’s for a while, but they’re turning out to be rather a challenge. So, I’m going to cheat for a while and dodge learning how to do them from scratch….I’m going to use existing tops as a template instead. That way, fabric is next to skin, which will feel more comfortable, plus if anyone decides to buy anything from me I can just take their measurements and source the appropriate clothing to embellish. That avoids the endless issues with shaping the cups to the individual. Gawd, I sound like I know what I’m on about. I’m just experimenting really. I’ve tried looking for work for a bit of extra income but jobs are thin on the ground around here and never seem to fit around life with two kids and a massive dog. So, I’m trying to make more things and maybe I’ll open an online shop dooeywatsit when I feel more confident. Here’s the very beginnings of my new design. This is just pinned in place very roughly, I shall probably be attaching chains along the seams and adding a few sparkling scales. The idea is that it will end up being something that can either be worn as a clubbing sort of top, or underwear. Either way, I’d like it to look classy and preserve a bit of dignity. Chainmaille is well, rather see through if you don’t add a lining, so can be difficult to wear. Waffling aside, here it is! Japanese weave outline, with a ‘rose’ added for a bit of detail. It’ll look tidier when it’s sewn in place properly. Probably adding chain to outline the bust too. Not appropriate for the school run, I know the mums there would look at me funny if I turned up at the school gates in wellies and this outfit….but it will hopefully look amazing on the right person at the right event. I’ll update as I progress with this. It may yet end up as a disaster, but I’m going to work on it anyway and hope for the best. 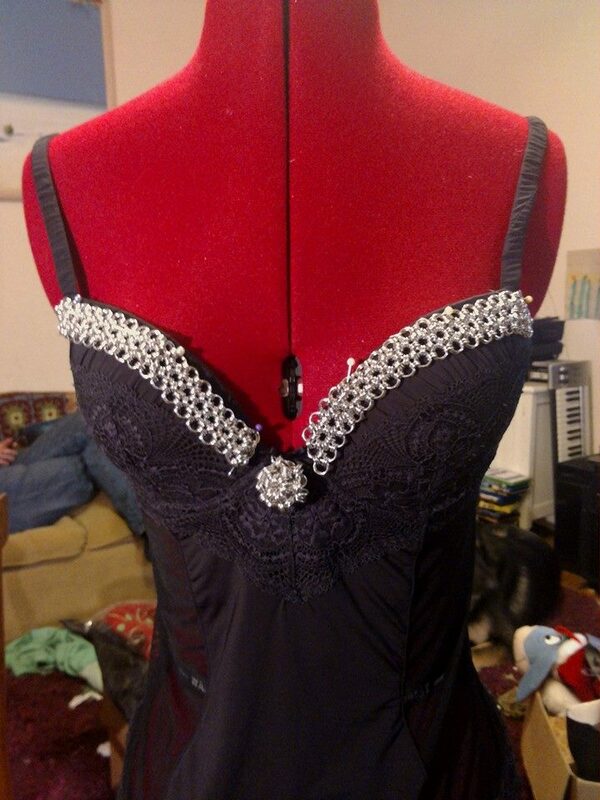 This entry was posted in Craft Projects and tagged chainmaille, Craft, evening wear, jump rings, Lingerie, metal, scalemaille. Bookmark the permalink. Lovely to have you back blogging. The top isn’t for me either but I like it to look at. Its looking good -you’ve far more patience than I have. Hope it this proves a successful venture! Lent – did YOU give anything up?